Will U.S. and Russian Forces Clash in Syria? Originally published under the title "Trump Is Tripping Over Iran and Russia's Red Lines in Syria." In the past five weeks, U.S. forces in Syria have struck directly at the Assad regime and its allies in Syria no less than four times. On May 18, U.S. warplanes struck regime and allied militia forces that breached a 34-mile exclusion zone around a U.S. outpost in southeastern Syria. Then on June 8 and June 20, the United States shot down Iranian-made drones as they approached the outpost. But the most dramatic event so far was the June 18 downing of a Syrian air force Su-22 by a U.S. Navy F/A-18 Super Hornet. This took place after regime forces attacked a town held by the U.S.-aligned Syrian Democratic Forces (SDF) near Tabqa, in northern Syria. The Su-22 dropped bombs near the SDF fighters, ignored U.S. warnings, and was then shot down. The downing of the Su-22 threatened to bring Washington and Moscow into conflict in the war-torn country. In the aftermath of the incident, Russia announced the end of deconfliction arrangements with U.S. forces and that it had decided to treat future U.S. flights west of the Euphrates River as hostile. Syria is quickly devolving into a free-for-all. There is a high possibility of further friction among regional powers, as the Russians, Americans, and their various clients scramble to realize mutually incompatible objectives — specifically in the areas of eastern Syria held by the now collapsing "caliphate" of the Islamic State. Syria is quickly devolving into a free-for-all. So how did events in Syria reach this pass, in which direct confrontation between United States and Russia is no longer unthinkable? And what might happen next? Syria has been divided into a number of de facto enclaves since mid-2012. But a series of events over the past 15 months has served to end the stalemate in the country, ushering in this new and dangerous phase. Russia's entry into the conflict in September 2015 ended any possibility of rebel victory and the overthrow by arms of the regime. Syrian President Bashar al-Assad — with invaluable help from Russia, as well as Iran and its various militia proxies — went on to clear the rebels out of the key cities of Homs and Aleppo. A diplomatic agreement establishing four "de-escalation" zones then consolidated regime control of western Syria. Direct confrontation in Syria between the U.S. and Russia is no longer unthinkable. This development has enabled the regime to divert forces to the effort to reassert control over the east of the country. As it does so, the regime is encroaching on a conflict from which it had previously been largely absent: the war between the U.S.-supported, Kurdish-dominated SDF — along with other, Arab rebel clients further south — and the now retreating jihadis of the Islamic State. The confluence of interests between Damascus and Tehran on this battlefield is clear. Iran, whose proxies form the key ground forces available to the regime, wants to secure a land corridor through eastern Syria and into Iraq. The Assad regime wants to re-establish a presence on Syria's eastern border. Regime forces are thus now advancing eastward on two axes: one from the town of Palmyra and the second from south of Aleppo. It was friction along the second axis, as regime forces closed up against areas controlled by the SDF, that caused the events leading to the downing of the Syrian Su-22. A geographically inevitable contest of wills is developing — between the regime and its associated forces as they drive east into Islamic State territory and U.S.-associated SDF and Arab rebel fighters, who also seek to control the former Islamic State areas. Moscow's forces are an integral part of this regime push east, with Russian air power and Russian-supported ground forces especially present in the Palmyra offensive. For a while, it seemed as though the United States and its allies had the upper hand. In mid-2016, the United States established a base in the Tanf area at which U.S. and allied special forces personnel have been training the Maghawir al-Thawra (Revolution Commandos) rebel group. This raised the possibility that these Western-supported Arab forces might link up with SDF fighters in the north. Together, they would then clear the Islamic State out of the Euphrates River valley, complete the conquest of Raqqa, and establish that they control the territory in question before regime forces could make an advance. 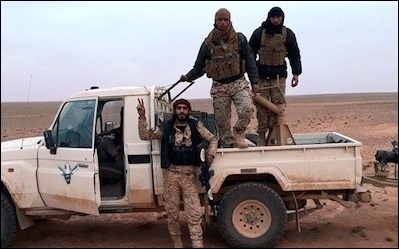 Maghawir al-Thawra fighters in eastern Syria. In order to decisively preempt this possibility, Iran's Islamic Revolutionary Guard Corps (IRGC), Hezbollah, and Assad regime and Iraqi Shiite militia forces on June 9 made a lunge for the Syria-Iraq border along a line north of Tanf, effectively dividing U.S.-supported elements from one another. Maghawir al-Thawra was trapped south of the new line established by the regime side, as the SDF still engaged the Islamic State far to the north. The rebels, if they wish to progress further, now need to break through regime lines to do so. That would be inconceivable without U.S. help. Iranian and pro-Iranian regional media were quite frank about the intentions behind this sudden move. A report in the IRGC-linked Fars News Agency described the thinking behind it as follows: "America ... wants to link the northeastern part [of Syria, which is controlled by the Kurds] with the southeastern part, which is why it has stepped up its activity in the al-Tanf area." 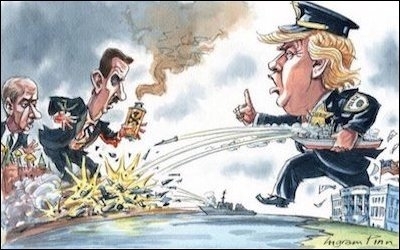 The Syrian army and its allies, the article went on to say, defied American "red lines" in a military advance designed to thwart this strategy. This is where the war currently stands. The latest reports suggest that the United States is in the process of beefing up its presence in the Tanf area. A new base is being built at Zakaf, 50 miles northeast of the town, according to pro-U.S. rebels. The United States has moved its High Mobility Artillery Rocket System (HIMARS) into southern Syria for the first time. Capable of firing rockets and missiles to ranges of nearly 200 miles, the system constitutes a significant increase in U.S. firepower on Syrian soil. So where is it all heading? The downing of the Su-22 may serve, for a while at least, to demarcate the zones of U.S. and Russian air activity over the skies of Syria. But the real contest is the one on the ground. And here, the prize is the eastern governorate of Deir Ezzor, the site of a large part of Syria's oil resources. Does Russian President Vladimir Putin's warning about American air activity west of the Euphrates mean that this area will need to be ceded in its entirety to the regime? Will the United States agree to this? The Russians have no crucial interest of their own causing them to back the ambitions of the Iranians in the east. But for as long as the going is relatively easy, it appears that Putin also feels no special compunction to rein in his allies. Perhaps both Moscow and Tehran simply assume that American interest in the area is limited and hence that Washington will not take risks in order to counter red lines set down by other players. The crucial missing factor here is a clearly stated U.S. policy. The crucial missing factor here is a clearly stated U.S. policy. Trump can either acquiesce to the new realities that Russia seeks to impose in the air, and that Iran seeks to impose on the ground, or he can move to defy and reverse these, opening up the risk of potential direct confrontation. There isn't really a third choice. Fars News Agency concluded its recent report in the following terms: "The imbroglio in eastern Syria has only begun, and stormy days are ahead of us." In the face of much uncertainty, this point at least seems crystal clear.